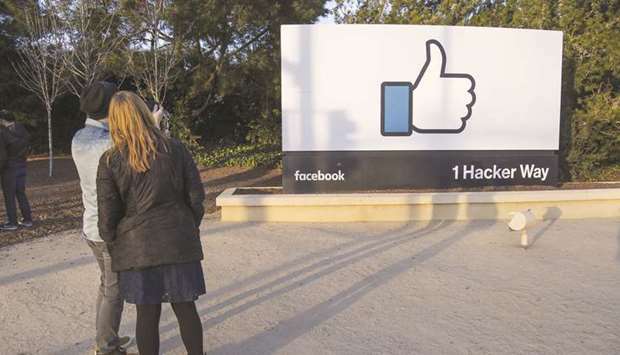 Pedestrians take photographs of signage displayed outside Facebook Inc headquarters in Menlo Park, California. Facebook, which has been criticised for enabling manipulation of its news feed, has consistently said it does not want to be considered a media organisation that makes editorial decisions but wants to support journalism and efforts to fight misinformation. Facebook announced yesterday that it will invest $300mn over three years to support journalism, with an emphasis on promoting hard-hit local news organisations. In the US, social media has overtaken print newspapers as a news source for Americans, according to a survey released last year by the Pew Research Center. The survey report found 20% of US adults say they often get news via social media, compared with 16% from newspapers. Facebook, which has been criticised for enabling manipulation of its news feed, has consistently said it does not want to be considered a media organisation that makes editorial decisions but wants to support journalism and efforts to fight misinformation. It has funded fact-checking projects around the world, including one in partnership with AFP. Facebook’s effort is “a lot of money in one sense but in another sense it’s not that much, the equivalent of revenues of one large newspaper,” said Dan Kennedy, a journalism professor at Northeastern University. “It’s certainly better than doing nothing, and I hope it will be of some help,” Kennedy said. In Facebook’s case, it includes spending to get media companies to produce content for its Watch video feature. In Google’s case, and to some extent in Facebook’s as well, the aid that is being given amounts to help in convincing newsrooms and journalists to use the company’s products more,” Ingram wrote. The Facebook initiative includes a $5mn endowment to the Pulitzer Center to launch “Bringing Stories Home,” which will foster coverage on topics that affect local communities — funding at least 12 local in-depth, multimedia reporting projects each year. Facebook also said it giving $6mn to the British-based Community News Project, which partners with regional news organisations and the National Council for the Training of Journalists. Facebook said it would invest over $20mn to continue the initiative in the US and to expand globally, including in Europe. The funding includes $2mn for the Report for America initiative to place 1,000 journalists in local US newsrooms over the next five years and $1mn for the Knight-Lenfest Local News Transformation Fund, a news innovation and technology hub. It also includes a $1mn commitment to the American Journalism Project, aiming at promoting venture philanthropy and local civic news organisations.